Wish I could have filmed the making of this shoot!!! So I came up with an idea to do a really cool romantic flirty beauty shoot with the poem 'Roses are Red...' which I have been dying to do for agessss!! I have seen very lovely beauty shoots in the past with flowers being used as props... but hardly just 'PETALS'... at first my idea was to scatter the petals across the models chest and on the floor and have her being shot whilst lying down. 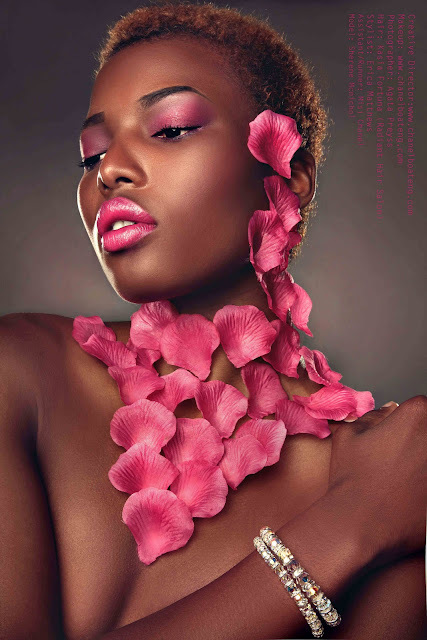 The photographer thought it would be more interesting to have the petals as if the petals grew on her, in the end we stuck the petals on one by one to have a growing effect! All petals had a themed makeup to match, accept the brown/ orange lips look which Erica our fabulous stylist, styled with a faux fur sleeve and it added to the entire shoot perfectly!!! All jewellery was provided by the talented Marina Prokopiva. I put together this love beauty story titled 'Love & Kisses' (title by Shevelle Rhule from Pride) which is featured in this months beauty pages of Pride Magazine. 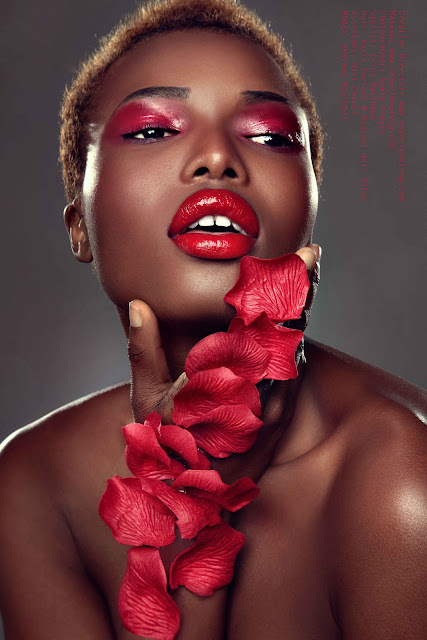 Pride, do the best beauty stories for black and ethnic women. I am very pleased that the submission was successful as the spread looks fab! OMG these make up looks are so stunning! Thank you so much for sharing them and inspiring me! I used to write a huge amount of essays about beauty in college. And it was quite difficult to write research paper thesis, but I found decision online. Interact with other gamers online. Video games were commonly enjoyed alone in the past but you can now mix socialization into your gaming experience. A forum based around your favorite game or genre is the perfect place to chat with fellow fans and get valuable tips and information to better your game.